The waters off Isla Mujeres towards Isla Contoy are certainly special. Although the largest and most reliable attraction here is the world’s largest congregation of Whale Sharks, in the hundreds, it is not unusual to also see giant mantas, schooling mobulas and other pelagic life when out here. This skin-diving experience is suitable for everyone, even small children and older adults. The waters are almost always dead calm and the Whale Sharks calmly swimming by or static, sometimes bouncing up and down in a bottle position, feeding off of the Bonito eggs that bring them here. 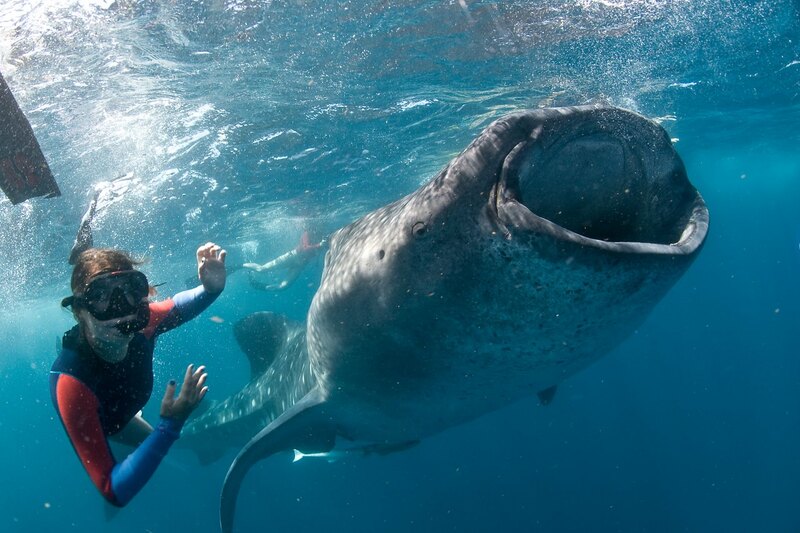 This is far and away the world’s best Whale Shark encounter. The Whale Sharks are here May through September, with peak season being June, July and August. The XTC/Yucatan Dive Trek group of companies facilitate unique travel opportunities to the Mexican Caribbean coast and broader Yucatán Peninsula, focusing on nature and wildlife encounters in marine protected areas, as well as yet undiscovered cultural attractions, catering to travelers who seek extraordinary, authentic experiences. Copyright © 2019 yucatandivetrek.com. All Rights Reserved.